By now you have likely seen the picture above or my original post. In September I took these guys to World Maker Faire in New York City. 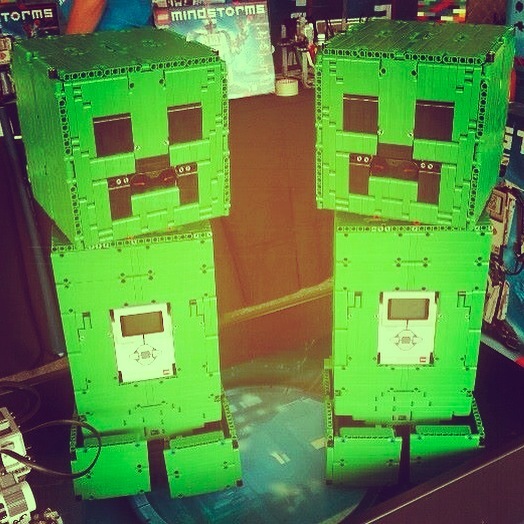 These bots were a huge hit, bringing Minecraft to life! Since the original video, I have received one question to no end: does it explode? My answer? See for yourself! My latest video takes captures some of my favorite moments from World Maker Faire. The event was a team effort bringing employees from LEGO as well as the greater LEGO MINDSTORMS Community together. There is so much overlap between the MINDSTORMS Community and the Maker Community! It was great to share ideas and projects with others! These Creep3rs will be touring for a bit. My good friend Marc-Andre has one up in Canada. In addition, a couple of these guys will be traveling with me to Brickworld Tampa in a couple weeks!